When a person sleeps on their side, there’s a great distance placed between the head and the mattress compared to the amount of distance between the head and the mattress for people who sleep on their stomach or back. This distance must be filled in order to keep the neck straight and the spine aligned. The Tempur contour side to side Breeze by Tempur-Pedic is the best pillow for side sleepers. Tempur-Pedic recently came out with the Breeze memory foam mattress, which is one of their top sellers. The Breeze memory foam pillow can be the perfect complement to your sleeping experience and one that can help you enjoy a better night’s rest. The avid side sleeper will run into a number of problems during the night, especially if they’re used to down filled pillows or standard shaped pillows. Pillows often slip out from beneath the face during the night or can easily flatten out. And most down pillows simply aren’t up to the task of providing any sort of support. If you’re a side sleeper then you’re probably more than familiar with tension in the neck and face, sore muscles and a restless night’s rest. But all that will change once you give the Breeze side to side pillow a shot. Quick Tip: This model is reasonably priced and designed to last for years. It has a reputation for retaining its shape, even after several months of use, but it’s also known for meeting the needs of only a certain type of sleeper, and that’s one that enjoys a pillow with plenty of support and firmness. Because of the greater distance between the mattress and the head, side sleepers usually require a thicker pillow to keep the neck and head in a neutral position, and standard pillows just aren’t able to get the job done. 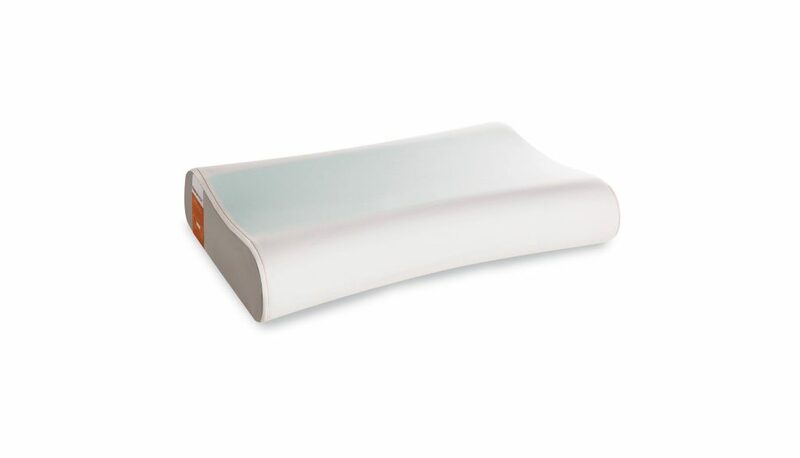 The Tempur-Contour side sleeper pillow features a unique ergonomic design, a dual feel design, plus a cooling gel, which offers additional support as the user moves from side to side. This dual feel design uses targeted support as it cradles the head. It’s equipped with a softer center and firm support at the edge. The Breeze gel layer works to keep you cool and comfortable during the night. The patented Tempur material throughout the pillow targets the neck and head while the softer inlay material provides comfort in the head rest area. This innovative design offers both high and low sleep profiles. The high-profile measures in at 4.75 inches, with the low profile coming in at 4.125 inches. The pillow’s ergonomic curved shape provides even support as the user moves from side to side. The included premium knit cover is breathable, soft and machine washable. This pillow also comes with a five-year limited warranty against defects for both the pillow and the cover. Because the side sleeper rests with their face against the pillow, the pillow’s breathability is important. The Tempur-Contour offers targeted cooling, preventing the pillow from retaining body heat and working to keep you cool and dry, even in warmer weather. As a side sleeper, you’ll require a pillow that offers the type of stability only the Tempur-Contour can provide. Often, people decide to purchase a new pillow once they’ve become fed up with interrupted sleep, neck pain, muscle cramps, muscle spasms, and even chronic headaches. Improper neck support can lead to tension headaches, lower back pain, and trouble falling or staying asleep. If you’re a side sleeper and dealing with some of these sleep issues, then this pillow may be the answer you’ve been looking for. The pillow is designed to correct spine alignment, improve circulation, and reduce tension in the neck. This pillow is available in high or low profile styles, so you can choose the best model based on your size. This pillow can be used by both side sleepers and back sleepers. Cons: There were several consumer complaints regarding the pillow’s firmness, with many stating that the pillow was too firm and uncomfortable to use. Other buyers had issues with the loft style, stating it was too high and caused tension in the neck and headaches. However, the manufacturer offers two loft sizes to choose from. Choosing the appropriate size can prevent any neck soreness or tension. Regarding the firmness, it’s a matter of breaking the pillow in. Over a period of a few weeks, you’ll notice a change in the pillow’s firmness so you’ll be able to enjoy a pillow that offers a customized level of firmness that’s perfect for you. Most consumers felt that the pillow was a better choice for back sleepers, especially if you’re a side sleeper who tends to sleep with one arm under the pillow for added support. If you enjoy a pillow that offers a little more cushioning and give, check out the Zoned gel dough gel-infused memory foam pillow by Malouf. Love it or leave it, there was plenty of mixed feedback from consumers. Most users can agree that this is one pillow that needs to go through a break-in process, which can be a major downside for sensitive sleepers. Essentially, you’ll need to use a pillow that’s too firm for a period of two to three weeks before the pillow begins to soften and offer the right amount of support. Many people complained this entailed poor sleep during the process. Others simply raved over the amount of support the pillow offered, not to mention the fact that over time, this pillow won’t flatten out like other side sleeping pillows in this price range. Ultimately, it all boils down to a matter of user preference. If you enjoy a pillow that offers extra support, then this is the model for you. If you enjoy a pillow that offers a combination of support and the type of softness many memory foam pillows are known for, then you may need to pass this model by. We felt that the high-quality, breathable materials, and overall quality made this pillow worth the purchase, just as long as you can get past the break in period.